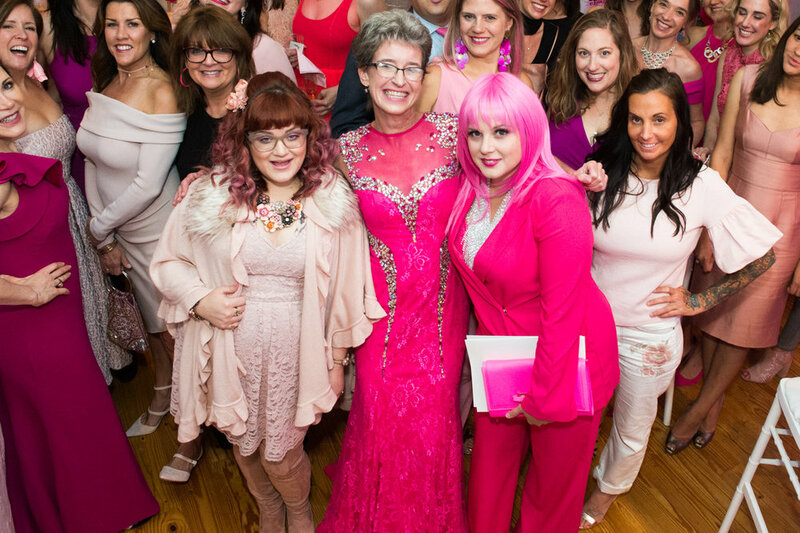 Pink Champagne Gala Wrap Up! Oh my goodness...you guys...I don't even know where to begin. If you were one of the luckies that got to get Pink with me this weekend, THANK YOU! If you were one of the not-so-luckies that couldn't make it: have no fear...ROUND 2 WILL BE NEXT YEAR! But for now, let me just say that last night was absolutely everything I wanted it to be: so much fun, made new friends, so intimate and such good energy and to top it all off we were raising money to give to the local Susan G. Komen Pittsburgh. The night was simply magical. Period. As you can see from the photos, a great (incredible, fantastical, amazing) time was had by all. There was so much laughter, so many smiles and a pink room filled with the most generous and wonderful people you'd ever want to know. And the FASHION! Oh my goodness!! It was like I died and went to heaven: pink designer everything everywhere I looked! Big, huge, GINORMOUS thank you to every single person that came out Saturday to make mine and Raemie's very first (but not even close to last) gala a huge success! We could not have done it without each and every one of you. Thank you thank you thank you!!! I'd also love to thank the list of folks below that came through to donate so many wonderful services and products. I'd also love to give a HUGE shout out to Annie O'Neill and Nancy Andrews for helping us get everything ready, and to Nancy: THANK YOU for these incredible photographs. I can't thank you enough for taking my camera off of me to make sure the night was documented!! You're the BEST! Thank you for all the help! Wenning Entertainment: swanky uplighting Sweet B Sweet Shop: seriously delectable sweet treats Mosaic Linens for the special rate, allowing us to beautify my ‘lil studio!